This is another book in the series about a little boy named Lee who lives near a lake. Lee has a penchant for getting into trouble. He is strong-willed and obstinate. 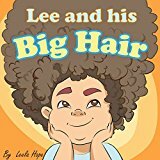 Lee refuses to comb or brush his hair. One of his favorite pastimes is playing in the mud. Lee also refuses to cut his hair. One day he rolls around in the mud. When Lee gets up, everything is stuck to him. He runs to the lake to wash the mud off, but he cannot get the mud or the debris that is stuck in his hair. A barber is summoned. Readers will be shocked at what he finds in Lee’s hair. This book is written in rhyme with humor that children and adults alike will enjoy. Perfect for teaching children the importance of good hair grooming. Recommended for ages three through seven. Lee is a young boy who decides to take advantage of the fact that his mom is busy gardening. He spies a tin full of candy and decides to finish it all. Of course, he gets really sick. Lee’s mom finds him in a sugar trance on the floor. The doctor has never seen a case as bad as this. Lee is forced to drink a concoction of healthy fruits and vegetables. A difficult lesson to learn that will not be forgotten. 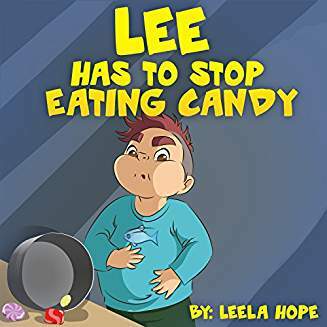 This book is written to teach children the value of good nutrition and that too much of a good thing has consequences. Colorful illustrations and large font make this book a good choice as a beginning reader or picture book. Recommended for ages preschool through primary grades. If you enjoyed reading these posts, please subscribe by clicking on the word Follow or by hitting the orange RSS FEED button in the upper right-hand corner of this page. What a cute series! Thanks for linking up at Booknificent Thursday on Mommynificent.com! The author is prolific. I like the series because it addresses many of the issues parents of toddlers and preschoolers face.